Experiencing Breathing Problems while you sleep? Suffering night after night with sleep apnea can be a miserable experience for you and others. When you don’t wake up well rested in the morning, it can affect every other area of your life. It adds more stress, makes you less productive, and you just feel ‘zombie-like’ as you go about your tasks. Not a pleasant feeling! The answer to your prolem is the bed wedge pillow. Sleep apnea ranges from mild sleep apnea to severe. People who experience mild sleep apnea suffer fewer symptoms than those with severe sleep apnea. Sleep apnea symptoms include snoring, restless sleep, headache, neck pain and more. A foam wedge pillow is one of the go-to treatments for sleep apnea. How would you like a wedge pillow that is made from memory foam, comes in multiple sizes, has a washable cover, is only 7” tall, and is made in the USA? This is definitely the best overall bed wedge pillow. You sleep on average seven hours a night, so that’s over 2500 hours a year. 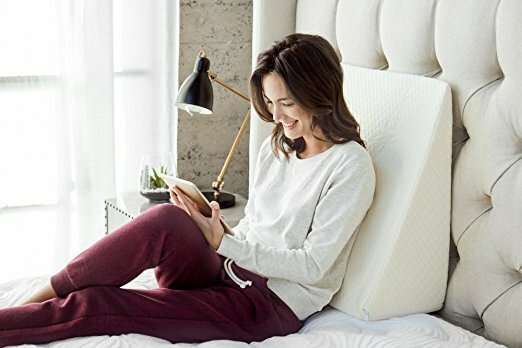 You want every one of those hours to be well rested, so make sure you check out this foam wedge pillow. Anything made exclusively out of memory foam is going to be the most comfortable wedge pillow! This one by Comfort Dreams only comes in one size, but it is very attractive and soft for sleeping. It is 10 inches high and elevates your body for sleeping better with sleep apnea. Do softer foams in pillows and mattresses sink too much and not offer as much support as you need? This wedge pillow is the firmest and has been used in the medical profession to help patients. It’s nice and high to elevate your body, and it really helps your sleep apnea, too. For customers on a budget who still want a comfortable and effective pillow, this one is for you. It’s hypoallergenic and safe for many months or years of use. Do You Need a Wedge Pillow for Sleep Apnea? ​There are numerous benefits to using a wedge pillow for sleep apnea. You’ll start to notice those benefits after the first night, and it will only get better over time. Many long-time sleepers swear by their wedge pillow and wouldn’t go back to sleeping flat again. Bed wedge pillows are uniquely designed to gently raise your head, neck, and shoulders off the flat surface of your mattress. By doing so, something very unique happens. Your airway in the back of your throat start to open up. It’s the same phenomenon that occurs when you’re standing upright and your airway is open. By becoming more vertical in alignment, your sleep apnea will greatly reduce. Wedge pillows are also great for those with digestion problems, back issues, or for those who snore. They can be the solution to having a terrible night’s sleep due to sleep apnea. 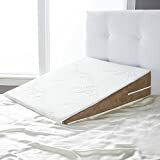 Whether you’ve had sleep apnea for years or have just been diagnosed with it, using a bed wedge pillow will improve your condition starting with the very first night you use one. These excellent pillows are made with different types of foam, so you’ll have fun choosing which one is the softest and most comfortable for you. Some are firmer, for those who need that extra support. Take a look at the following wedge pillows and choose which one is right for you. This soft bed wedge pillow adds comfort for back or joint pain. It supports your relief for acid reflux or sleep apnea. It’s over 9 inches thick and is made of memory foam in this unique and comfortable wedge shape. It comes with a washable zippered poly-cotton cover. Great for reading in bed. Helps with many health problems. Could be too high to help with sleep apnea. Only comes with one cover. This wedge pillow is one of the best for sleep apnea. The memory foam makes it comfortable and it will elevate your head and neck for optimal sleeping. 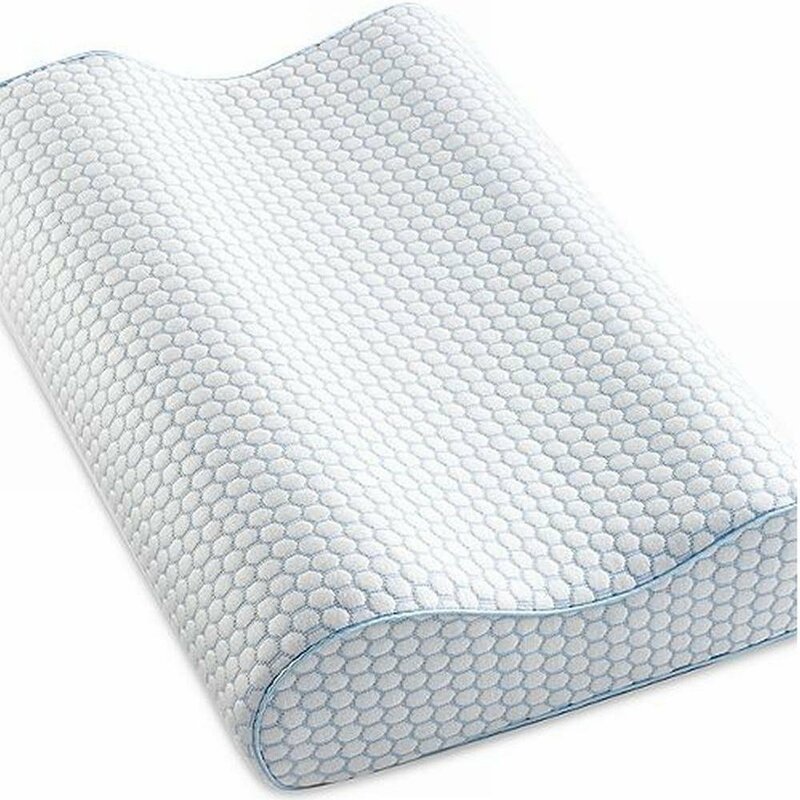 This comfortable bed wedge pillow is for night time relief of many ailments, like acid reflux, heart burn, and sleep apnea. It has a 7 inch rise that elevates your head, neck, and shoulders. It has 1 inch of 4 pound memory foam and a base of firm furniture grade foam to provide support. Comes in four sizes – twin, queen, king, and X-large. Need to make sure it’s the right size before purchase. Could be a bit firm for some sleepers. This wedge pillow gets an overall high rating from sleepers. It’s specially made for those who have problems sleeping at night due to health issues like acid reflux, snoring, and chest congestion, in addition to sleep apnea. This bed pillow was specifically designed for patients by medical professionals. It helps your sleep apnea, as well as additional back or neck problems. It’s made of medical grade hard foam, not memory foam, which is better for back support. It improves your sleeping comfort, circulation, and your body position. Comes with zippered, removable blue pillow case. Non-returnable and non-refundable due to state hygiene regulations. Not as high quality as other wedge pillows. Has a strong, paint-like smell. These EVA Medical bed wedge pillows receive a high satisfaction rating from customers. It is very firm and perfect for those who need extra support to prevent or reduce sleep apnea. You’re getting an excellent value with this Zuma bed wedge pillow from Brentwood. It comes in three heights – 7 inches, 10 inches, or 12 inches – for a perfect fit. It’s made from CertiPUR-US foam, so it’s hypoallergenic and safe for sleeping. Can be used when relaxing or sleeping. Has a knit fabric cover. Firm foam, which might be too firm for customers. Takes getting used to sleeping. Takes some time to inflate out of the box. This pillow is popular and works well for customers suffering from back pain, sleep apnea, and other sleeping problems. 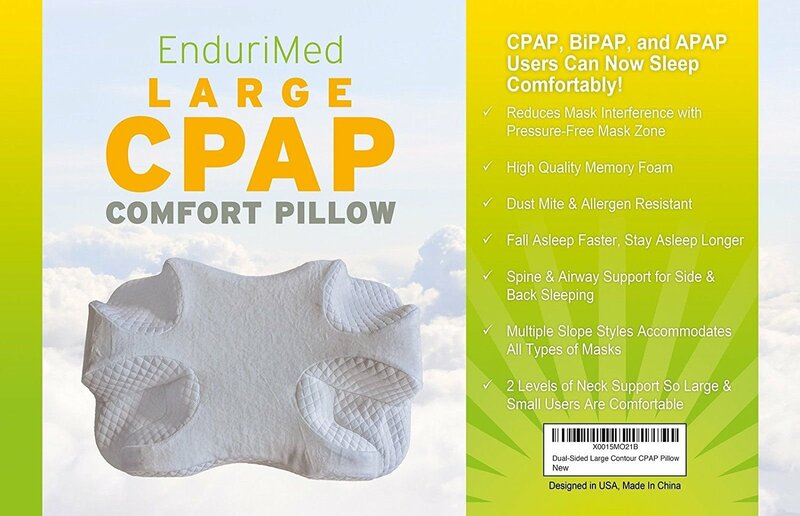 Although many other types of accessories will help you with sleep apnea (specifically for obstructive sleep apnea), including your CPAP or Bi-PAP mask, a wedge pillow provides something unique that no other piece of equipment does. It keeps your upper body (head, neck, and shoulders) elevated throughout the night. Bed wedge pillows physically reposition your body to obtain the maximum comfort and ideal sleeping position you need to sleep well all night. 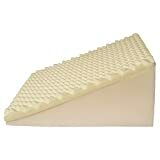 These bed wedge pillows have been used in hospitals, nursing homes, and patient rehabilitation centers for years to help patients obtain proper sleeping positions. Did you know it’s at night when your body does the most healing? That’s why using a wedge pillow for any ailment, including sleep apnea, is so effective. Your body gets a chance to rest. What size do you need? Not all bed wedge pillows come in the same size. You’ll need to do some careful measuring, since some of them can’t be returned. Along those same lines, you’ll want to make sure the pillow height is right for you. You’ll need to compare the different types of foam. You might be surprised at how firm some foams are. A wedge pillow that’s too firm won’t be comfortable. You’ll want to compare what the pillow cases are made of, since you’ll be rewashing them many times. You want durable and comfortable fabric. When you use a wedge pillow for sleep apnea, you’re adding one more helpful night time accessory that can give you an excellent night of rest. You can finally say goodbye to interrupted breathing. It can also put an end to many of the problems you suffer from. Firstly, wedge pillows are the best at keeping your upper body in an elevated position all night long. This takes the pressure off the back of your throat, which has a tendency to block your airway while sleeping and interrupt your breathing. Secondly, wedge pillows must be comfortable and made of soft foam. It won’t help you get the deep sleep you need if you aren’t comfortable. Thirdly, you’ll want a perfectly fit wedge pillow. Every sleeper’s needs are different, and the size really does make a difference when you have sleep apnea. The shape of wedge pillows defines their use. This is why using regular pillows just won’t be as effective as the wedge-shaped variety. Wedge pillows provide a gentle slope for you to rest your entire upper body. Wedge pillows help with other health problems. Do you have upper back pain or problems like compressed vertebrae or sciatica? Have you had digestion issues like GERD, acid reflux, IBS, or Crohn’s? Wedge pillows reposition your body and help your digestive tract and spine realign. Foam wedge pillows are wonderful for helping you with sleep apnea, but if you’re searching for something else that will help, try contour pillows. These are shaped like horseshoes. Wedge pillows are ideally meant for sleeping on your back. But contour pillows are great for side sleepers. They help support your neck, shoulders, and upper back, aligning your spine to help your breathing and giving you an excellent night’s rest. Having sleep apnea is a condition that has the potential to truly disrupt not just your sleeping, but the rest of your life. It’s no fun to not be able to fall asleep, stay asleep, or to wake up groggy. But when you use a bed wedge pillow, you’ll experience the benefits right away. 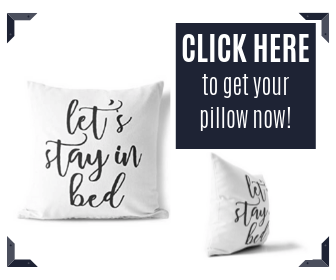 Your airways will open, you’ll breathe easier all night, and the pillow will quickly become one of the best things you’ve ever purchased to help your sleep apnea. Give it a try and sleep better tonight!